Spill is the colored light reflected from your background and onto your actor. Spill can show up on light colored clothing or hair, on shiny or reflective elements, around the edge of footage, and it can be a big problem! It can be very easy to fix, or difficult on finely detailed, extremely reflective or semi-transparent areas. Here are some methods of fixing spill. This is another in Toolfarm's ongoing In Depth series on green screen. We've brushed upon the topic of spill in other articles in this series, mainly giving tips on how to minimize spill during shooting. It's actually a problem that is fairly easy to fix, but can be difficult on finely detailed or semi-transparent areas. 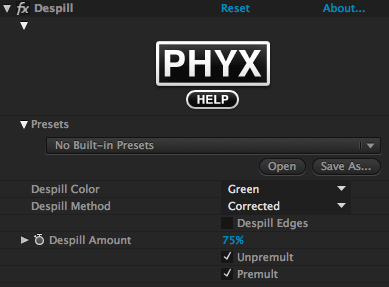 There are some great plug-ins and tricks that I'm going to cover that will help you immensely with spill. In this article, I'm working with a shot from Hollywood Camera Work, who kindly allows anyone to use their content for purposes like this. There are a lot of spill removal tools on the market and many keyers have built-in spill suppression. 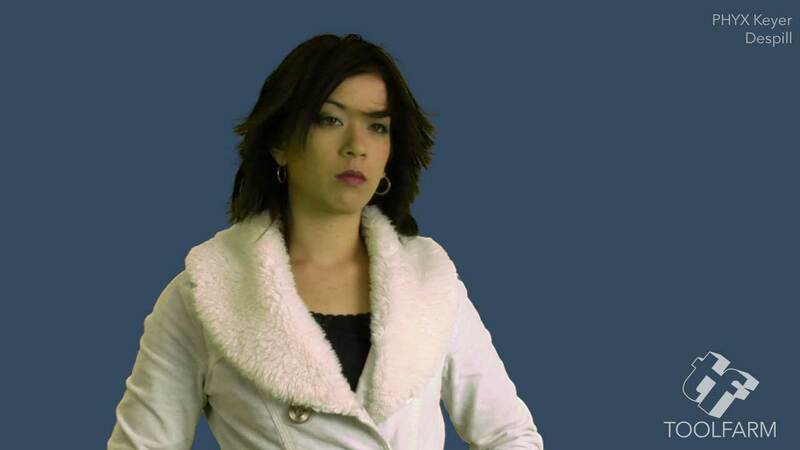 The image below is from Hollywood Camera Work, which has a lot of great shots to practice keying, and they are free! The model's white coat shows a strong green cast and is a really nice example for this article. Green spill is what you will likely have to deal with, as green screen is what is used in the majority of productions these days. That said, on the film Universal's Evan Almighty, visual effects company Industrial Light & Magic (ILM) utilized blue screens on the flood effects. Because of the blue coloration of the water, blue spill not so much of an issue and blue is less noticeable to the human eye than green is. If you're compositing the scene into a rain forest, the spill may just blend into the shot. 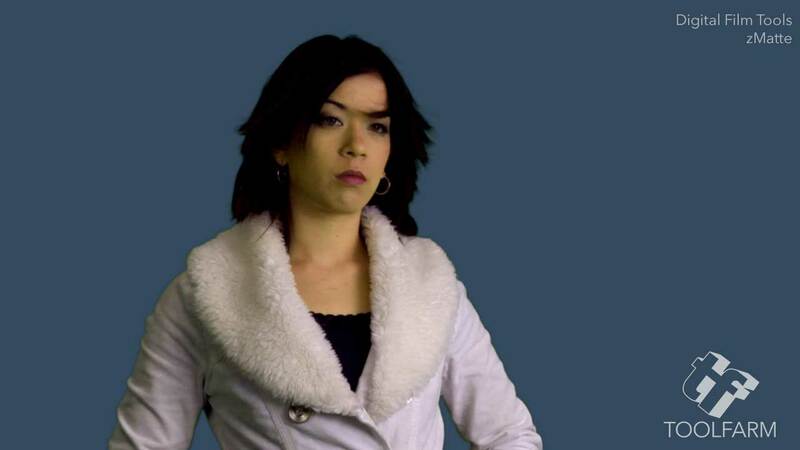 You can avoid quite a bit of spill when you're shooting by lighting the background separately and actor separately. Don't use a glossy or overly bright green screen because the reflectivity will cause the green to bounce onto your foreground elements. The image above from Hollywood Camera Work is very bright, but it's not necessary to have such a neon glowing shade of green. Below is an example of a shot that uses a much less bright screen and doesn't have the problem with spill that the shot above has. It is a bit dark but the scene she is composited into is also dark. Footage courtesy of Angie Mistretta from her training Toolfarm Professional Keying with Keylight: Toolfarm Expert Series. 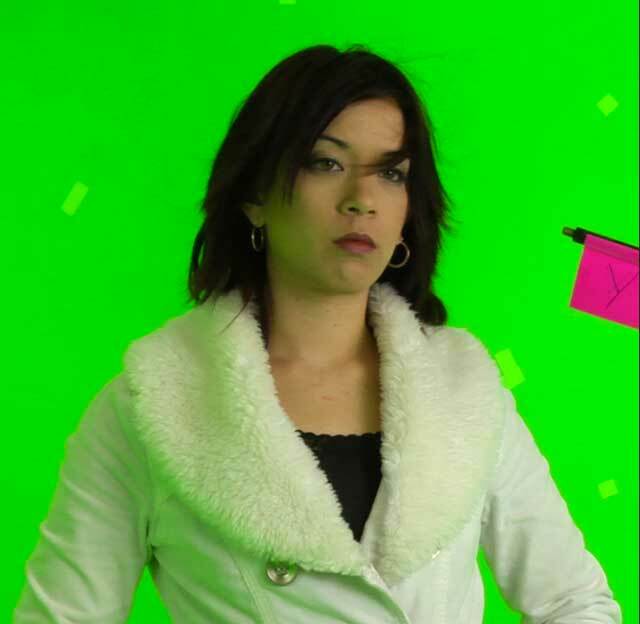 Digital Anarchy has some nice tips on lighting your green screen properly. Make sure the chroma key screen is lit evenly across. No hot spots or shadows. Be careful that your model does not cast shadows on the chroma key screen. She should be 6 to 10 feet in front of the screen and lit separately. Set up two lights, one from each side, and both a good distance from the screen. This will avoid getting a bright 'hot' spot in the center of the lit area. There are several spill removal tools on the market and many keyers come with built-in spill suppression. This example has a lot of spill on the actor's white coat and on her skin. If the actress were a blonde, you'd likely see a lot in her hair as well. First, I'll go over a few tools that are included in After Effects, so tools that you likely already own. Note that the spill suppression filters are applied AFTER the shot is keyed. Some tools have built-in spill suppression that is automatic, so the “before” examples may use a different keyer to show the original green. Also, if you pull a good key, you may not even need to use any type of spill suppression. Something strange that I discovered while writing this article is that, generally, the simpler a spill suppression plug-in is, the better the results seem to be. After Effects has always had great keying tools. 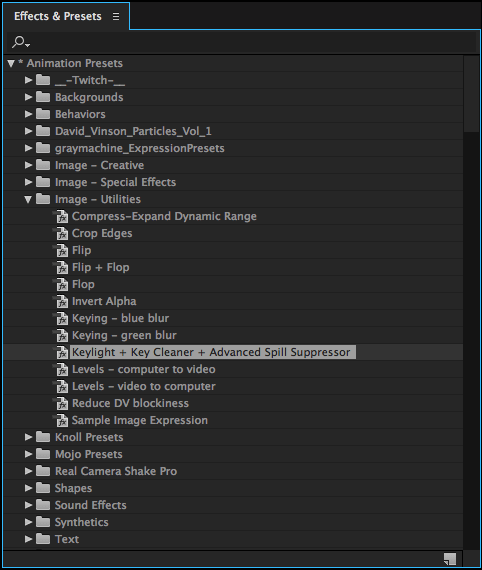 Adobe really upped their game with Key Cleaner tool and the Advanced Spill Suppressor, the new keying tools in After Effects CC in the June 2014 update. Advanced Spill Suppressor is a 32-bit color effect.The original AE Spill Suppressor was introduced the same year I got my first job in post production in 1995 and it has since been moved to the Obsolete effects. Slide the bar back and forth to see the difference before and after spill removal with After Effects Advanced Spill Suppressor. Here are a couple of tutorials on the new After Effects Keying tools introduced in After Effects CC 2014. The first is from Adobe TV and explains how to use the new keying effects and spill suppressor controls. The second, Adobe AE CC 2014 – Key Cleaner + Spill Suppressor is from Total Training. There are two Methods for Advanced Spill Suppressor, Standard and Ultra. Standard will automatically chooses the Key Color for you and it very simple to use. Ultra comes from the spill suppression in the Ultra Key effect in Premiere Pro. You'll have to manually set the Ultra Settings. Check out Carl Soule's video on the Ultra Key effect in Premiere Pro CC at the Adobe Site. The Foundry Keylight is included with Adobe After Effects and is the go-to keying plug-in for many After Effects users. It has all the features you need, including a built-in spill suppressor and for added control you can use Edge Color Correction, and it works great. The Bias controls work a bit differently than the spill suppression in other programs. With Keylight, the foreground is despilled automatically, which is great news. If you feel that it's still a bit too green for your liking, you can remove more. How? After you choose your Screen Colour from the image, adjusting the Alpha Bias parameter. Use the Alpha Bias eyedropper to select a prominent color, such as skin tones or hair color. This will help Keylight in separating the foreground and background colors. The Despill Bias and Alpha Bias colors are locked together by default and that will usually give you the best results, although you can uncheck Lock Biases Together and use them individually. It is possible pick a color in the bias that gives a really clean alpha channel, but a crummy despill, and vice versa. 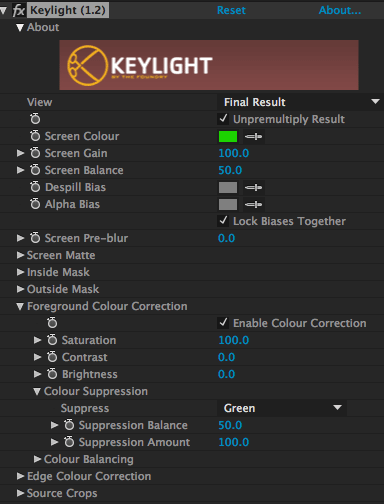 The Foundry Keylight is included with Adobe After Effects. To explain this one a bit, the Boris Chroma Key Studio ships with Boris Continuum Complete but there's also a Boris Unit for keying, Boris Continuum Unit: Key and Blend. This is the same tool within each product. 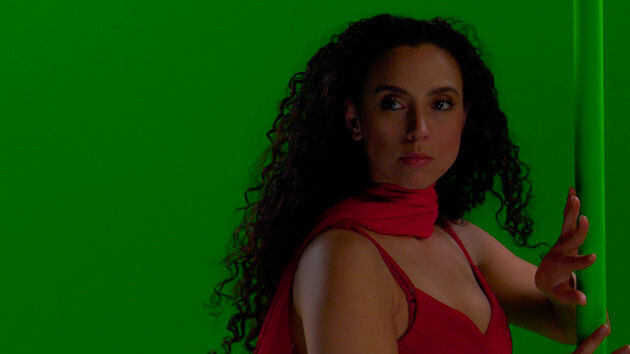 I demo'd the BCC Chroma Key Studio at NAB 2014, when it was released in BCC 9. Boris has always had keying tools but I never liked them. BCC Chroma Key Studio was a game changer. It pulled a great key for me and has great tools for pre-keying with the Quick Mask that you don't see in other plug-ins. This eliminates the need for a separate garbage matte. The spill suppression worked beautifully and I didn't even need to adjust settings. The Spill suppression is under the Chroma Key settings which are hidden until Spill Suppression On is checked. The Spill Suppression Group includes Spill Ratio, Spill Tone Mix and Spill Tone Range. According to the Boris Continuum Complete manual, for best results, adjust the controls in the order they are listed. 1. Adjust the Spill Ratio until most of the green background color is removed from the foreground image. With green screen footage, setting the Spill Ratio to 0 will turn your image magenta (or yellow for blue screen). Boosting the value to 200 will turn off the Spill Suppression. 2. 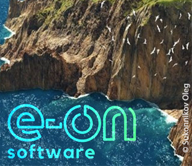 Spill Tone Mix will bring some of your green or blue background color into your foreground. If you increase Tone Mix value, you can compensate for some of the magenta that was brought in by lowering the Spill Ratio. 3. If you increase the value in the Spill Tone Range, it gives a broader range of the foreground color mix. This can also bring some of the original skin tones back into the footage. PHYX Keyer does come with six keying tools and Despill is one of them. PHYX Keyer did a beautiful job and the Despill plug-in neutralized the green perfectly. I never have too high of hopes when there are very few options for modifying settings in a plug-in. This seems to be a benefit here though because users aren't forced to tweak too many settings to figure out what works. I'm really impressed by this plug-in. 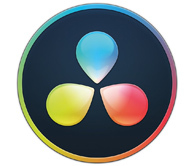 PHYX products are Mac only and require the FxFactory FxEngline to run. Download FxFactory for free from our downloads page. Digital Film Tools zMatte was one of the first keyers that I really loved because you just applied it, picked your background color and with very little tweaking you get a good result. zMatte ships with several tools for keying and compositing: Color Suppress, DeArtifact, Edge Composite, Frame Averager, Holdout Composite, Keyer, Light Wrap, Matte Generator, Matte Repair, Matte Wrap and Screen Smoother. DFT zMatte Keyer has built in Color Suppress but the zMatte package also comes with a separate Color Suppress plug-in, introduced in zMatte 3.0. HitFilm Ultimate may be a newer tool to many of you. It is sold now only as a standalone but the plug-ins come with the standalone. In other words, the plug-ins are still made but no longer sold on their own. HitFilm Ultimate comes with several keying tools including Advanced Chroma Key, Matte Cleaning, Spill Suppression and Auto Light Wrap. Spill Removal is another one of those tools with hardly any options, but it is very simple to use and the tools worked really well. I ended up lowering the Strength a bit to 0.80. I kept the Suppression Type set to Extended to achieve my result. If you have a fringe of color around your actor, remove it first with spill suppression. If you don't remove spill first, you run the risk of choking the matte in too far and losing your edge detail. You can also remove some spill by applying Hue/Saturation (Effects > Color Correction > Hue/Saturation) and taking down the green levels. 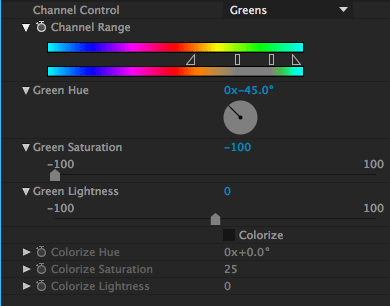 To isolate the greens so you don’t get a lot of shifting hues, choose Green in Channel Control. Lower the Green Saturation and shift the Green Hue more toward the yellows (this will depend on your footage). Adjust the Channel Range to isolate the green. I had the best results when I shifted the Green Hue a bit to the reds too, to offset some of the green, even after taking down the Green Saturation. If you don't have After Effects CC 2014 yet, try this instead of the old After Effects Spill Suppression plug-in. It will be a lot easier to use and the results are stellar. 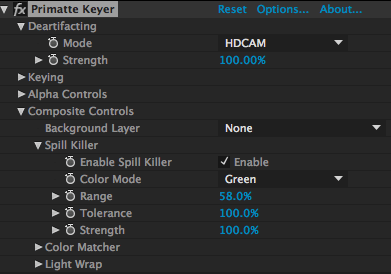 If you're using After Effects CC 2014, check out the preset named “Keylight + Key Cleaner + Spill Suppressor”. Apply it to your green screen footage to get your process going very quickly. 3. Christiansen, Mark (Nov 19, 2008). 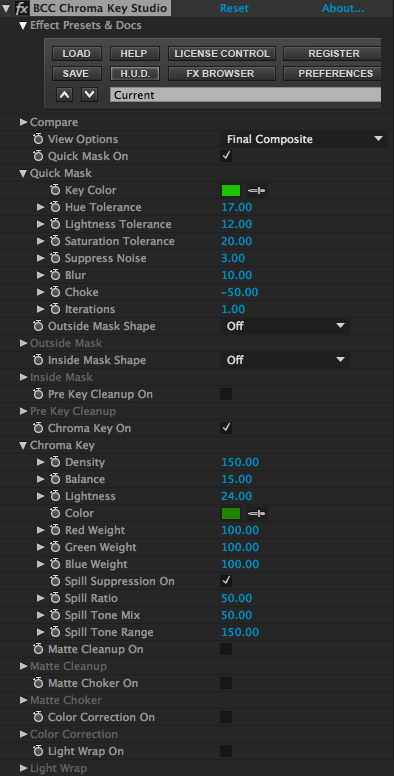 Color Keying in After Effects CS3: Get the Best out of Keylight. 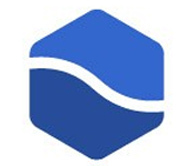 AdobePress.